The team expected nothing. I had hinted at nothing. This came out of left field and a was a punch to the gut for everyone. We had just over 8 weeks of cash left in the bank before we’d all be out of a job and Baremetrics would cease to exist. But I’m getting ahead of myself a bit. In September 2014, we raised $500,000 in the form of a SAFE. I had bootstrapped Baremetrics to $20,000 in monthly recurring revenue and had only hired one person, but then found myself with a sizable chunk of cash sitting in my bank account. At that point, Baremetrics was growing at a rapid pace, most months by 10–20%. So, what do you do when you’re growing rapidly and have a pile of cash burning a hole in your pocket? You spend it. Fuel for the fire, right? I mean, at that rate, we’d more than triple our revenue within a year, so it’d be downright foolish to not spend it! And spend we did. We spent $250,000 in 120 days, in fact. Most of that on payroll as we expanded the team from 2 full-time to 6 full-time team members. Within a year of the first investment, we were getting low on cash. So, we did what most funded startups do…we started looking to raise more money. Thankfully, our initial investor as well as one additional were willing to come in on the exact same term sheet as our initial funding. They certainly could have taken advantage of our situation and taken a big chunk of the company, but they didn’t. In December 2015, we took on another $300,000 in funding to extend our runway…which we then used to hire 2 more people. In hindsight, this sounds so crazy. I know that. Especially because I used the second round for hiring, knowing full well that’s what used so much of the money the first time around. I continued to be convinced that huge revenue growth was just around the corner. Eternal optimism is a tough beast to overcome. At this point we’d made the decision to expand outside of “Analytics for Stripe” to become a full “revenue analytics platform” that any business could use, regardless of their payment processor. That was going to be a huge engineering challenge, but would also fuel growth. So in my head, hiring more engineers just made sense because it’d help us with expanding our market which would in turn expand our revenue to cover our burn. But the fact is, that just didn’t happen. Dave Ramsey talks about “nerds” and “free spirits” when it comes to finances in marriage. The “nerd” loves to manage the budget while the “free spirit” loves to forget there’s a budget to manage. My wife is the “nerd” and I’m the “free spirit”. She’s managed our finances for the entirety of our nearly 12 years of marriage. It’s not that one is better than the other. Without the nerd, the free spirit would spend recklessly and go broke. Without the free spirit, the nerd would never spend any money at all and would be miserably uptight. They need each other for balance. When it came to Baremetrics, I was running the company as a free spirit. I was playing “visionary” and just assuming things would work out because…of course they would! I have vision! Then in May 2016, a buddy of mine was telling me about someone he used as a sort of freelance CFO. I’m fully aware of my free-spirit tendencies and had known for a while I really needed to have someone help me stay on top of the accounting side of things more (especially when it came to forecasting our profit & loss), but I’d free-spiritedly say I’d get to it “one day”. That “one day” arrived and I sent a note to the folks at Flightpath. We had a couple of short conversations, I gave them access to all our financials and they jumped in to build a custom financial model so we could better estimate and predict where we’d be in the coming months and years. Then I got a message from Jaakko (the CEO at Flightpath) asking me to hop on a call a week sooner than we’d originally planned as things weren’t looking so great. We hopped on a call, and this is what Jaakko showed me. 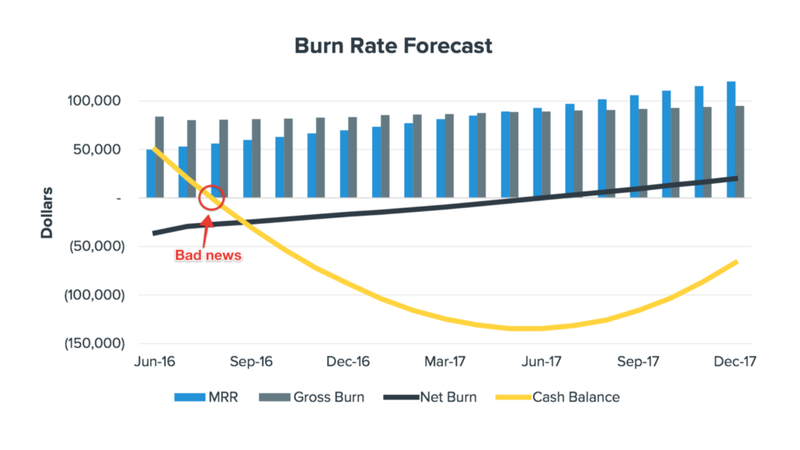 Burn rate forecast as of June 2016 showing us running out of money in spectacular fashion. This, my friends, is not what you want to see. Ever. That little yellow line? The one that looks like it’s smiling at you as it implies impending doom? Things were about to get really unpleasant. I had a call with Jaakko at Flightpath on a Tuesday. That’s when he showed me that chart and we started talking about how to fix this. We were net burning nearly $40,000 a month and needed to get that as low as possible or we’d run out of money. I spent the rest of that week and weekend trying to think of every possible scenario and option for fixing this. Should I raise more money? Do we need to lay off part of our team? What about doing some sort of consulting work to get a small influx of cash? Would a bank loan help? What about maxing out credit cards? Could I afford to not get paid a few months? What if everyone took a pay cut? I crunched every number I could think of and worked daily with Flightpath to work through a myriad of different possible scenarios with growth and cutting expenses to figure out how we could right the ship. A pay cut was the most viable solution. On Monday, a week after finding out about our financial situation, it was time to talk to the team. Every Monday morning we have a video conference with the whole team (we’re all remote). We talk about what we did the prior week and what we plan on getting done in the coming week, but it’s mostly an excuse to make sure we all see and hear each other regularly. We spend most of the time just joking around and talking about random things. It’s always very lighthearted and laidback. I start the video chat. Everyone is just hanging out, talking about the weather. I’m awkwardly quiet, waiting for the last person to show up. I’ve got my audio on mute and my camera turned off right until the last minute as I don’t want the team to see how nervous and on-the-verge-of-puking I am. The last of our team shows up and I jump in. I didn’t waste any time jumping in to the logistical details and didn’t really even pause because I was afraid someone would ask me a question or just be irate (even though that’s not the personality of anyone on our team). I found out last week that we’ve only got a couple of months of cash left and after spending the past week crunching numbers and figuring out how to fix this, a pay cut makes the most sense as it allows us to keep everyone on board.I know that’s a lot to take in and is out of nowhere. We’ll forgo our usual standup this week. Take some time to think through and process all of that and please message or call me to talk through any questions and concerns you have.Thank you so much for all of your hard work and I’m sorry we’re in this situation, but I’m confident we’ll come out the other side stronger. And that was the end of the call. I ended the meeting there and just sat at my desk sort of numbly staring at the screen waiting to see how our team would react. Within minutes nearly everyone had messaged me, most asking for details. What exactly would their reduced salary be? What about benefits? A couple openly expressed their (rightful) frustrations at me. Some took the rest of the day off. But at the end of the day, everyone took it about as well as I could have hoped, given I had let everyone down in a way that directly affected their livelihoods. Within the first month we reduced expenses by nearly $20,000 with salary cuts and removing all unnecessary expenses. In the months after we continued to reduce expenses by as much as $30,000 a month. The pay cuts I asked of everyone were intended to only last maybe 3–4 months. We were on the verge of expanding our available market, which our amazing team did a mere 8 days after being asked to take that pay cut. I figured expanding to additional payment platforms and launching an API would have skyrocketed growth, letting our team get back to full salaries well before the end of the year. But very few outperform Gail Goodman’s long, slow SaaS ramp of death. We certainly continued to grow, but not really any faster than before. Just boring, consistent growth. The pay cuts would need to stick around longer and one person on our team graciously offered to take a 50% pay cut for a couple of months to help get us to profitability. I asked the team to stick with the pay cuts until we hit profitability, at which point we’d start gradually decreasing the cut, and sure enough, our team pulled through and did it. In December 2016, we had our first profitable month since we took on funding in September 2014. That was “reduced payroll” profitable, though. But at that point we started gradually reducing the pay cut and as of last month (February 2017), 8 months after I asked the team to take a pay reduction, the team is back up to 100% salaries. 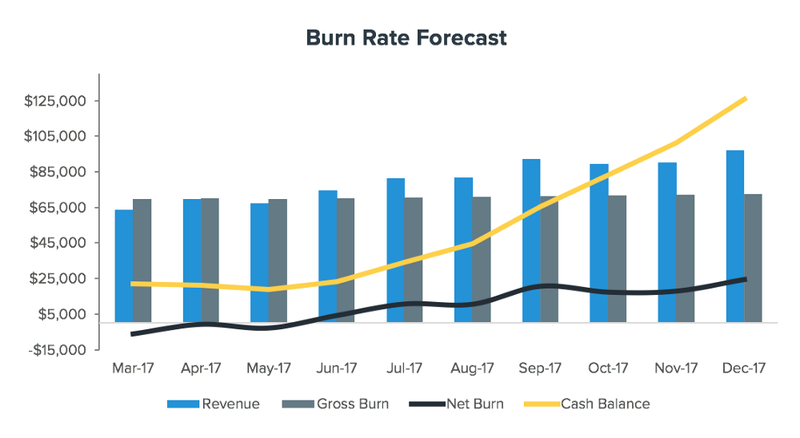 We’re still right at the line where some months are profitable and others aren’t (thanks to annual subscription fluctuations), but as you can see in this updated burn rate forecast, that sinister yellow smile is a lot more inviting. The past 8 months have taught me more about business than the prior 15 years of being an entrepreneur. I mentioned before the concept of “nerds” ands “free spirits”. Figure out which one you are and if you are not the “nerd” who loves the accounting and bookkeeping components, then find someone immediately. Seriously. Today. Right now. I waited far too long to do that, assuming my “vision” would somehow overcome, you know, reality. If you need a recommendation, I highly suggest the folks at Flightpath. They literally saved our business and have set us up with a really solid financial model that accounts for all the intricacies of building a profitable company (or becoming profitable, as it were). Most entrepreneurs I know are, like me, eternal optimists. Unfortunately that optimism can be a little blinding at times. Force yourself to regularly run through some worst case scenarios and figure out how that would play out with your company. The best way to future proof yourself is profitability plus 3–6 months worth of expenses as cash in the bank. Stop playing startup and instead focus on building a solid, sustainable business. That’s not to say all VC money is bad (I don’t believe it is), but far too many entrepreneurs take on funding thinking it’s the only way to build a business…and it’s not. You’ll likely be much happier as a human being without the stresses of operating at loss while you wait for growth to catch up (which, for many companies, never does). If you’ve raised money or if you’ve just got lots of cash in the bank, the tendency is to spend it on hiring. The assumption is that hiring = faster growth. But the fact is, that’s rarely the case. Yes, in the long run having more people can lead to more growth but there’s a significant ramp up period for that (in some cases 6–12 months). Last June, when I realized things were so dire, I started reaching out to founders I knew to get advice. It was unbelievable how many companies had gone through similar situations. In fact, the very week I found out our finances were trouble, Joel Gascoigne had just written about how Buffer was in the same situation (though on a larger scale). That’s not to say I didn’t make mistakes (clearly I did), but understand you aren’t some epic failure because of your mistakes. The reality is, every founder makes mistakes along the way. Our team has been through a lot in the past 8 months as we’ve struggled to hit profitability. I’m unbelievably proud of the work that everyone has put in, especially after being asked to take a pay cut. That’s not what they signed up for, and they shouldn’t have been put in the position to need to take a pay cut, but they stuck it out, and for that I’m grateful. In the past we’ve been driven more by the train barreling towards us, doing whatever we could to get off the tracks before it was too late. That manifested itself in throwing lots of things at the wall and just hoping something would stick, but now, we do what we want. We do what we think is best for our customers, not what’s best for revenue. We grow within our means which means we’ll stick around, not being forced to call it quits because we’re running out of cash. We make our own rules and fully enjoy the ride.